Mr. Rafatjoo, a partner at Venable LLP, focuses his bankruptcy practice on insolvency and corporate restructurings, either through an out-of-court workout process or through a chapter 11 filing, corporate transactions, and mergers and acquisitions. He represents clients in complex reorganizations throughout the United States. Mr. Rafatjoo’s clients represent a broad spectrum of industries, including entertainment, retail, manufacturing, real estate development, building contractors and hospitality. Mr. Rafatjoo is AV® Peer-Review Rated by Martindale-Hubbell. 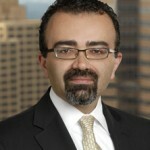 He has also been selected for inclusion in Southern California Super Lawyers, 2007–2012. He is a former Assistant Editor of the Norton Bankruptcy Law and Practice and former contributing author of the Wiley Bankruptcy Law Update.